Below are 12 actionable ways to lower churn, onboard users, turn customers into advocates and more using Intercom as your core customer success software or tool. The first, Upscope, is no-download interactive screen sharing for your helping your least technical and most confused customers. See their screen instantly and highlight where to click. The second is Anymailfinder is for email marketing and sales teams to rapidly find leads. We’ve used Intercom for around 3 years. 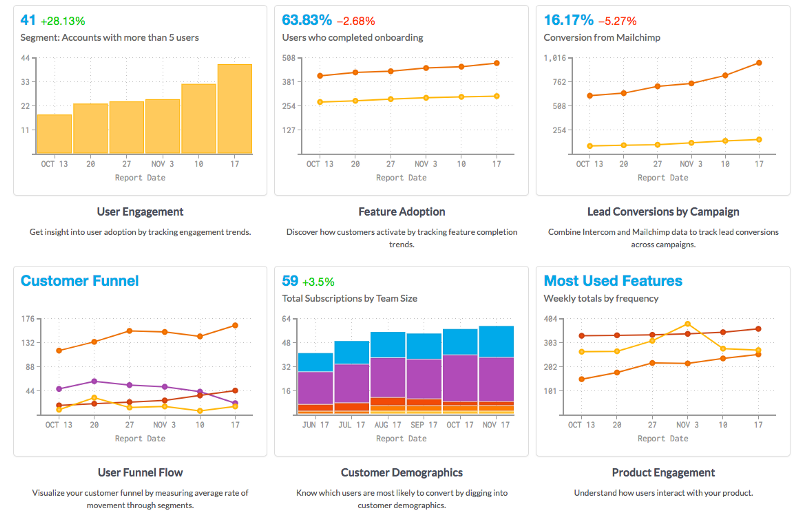 Using Intercom statistics to show the real value of customer success. Creating automated feedback when someone cancels. Giving proof when communicating feature requests to development teams. Onboarding enterprise clients and not losing them. Recommended! 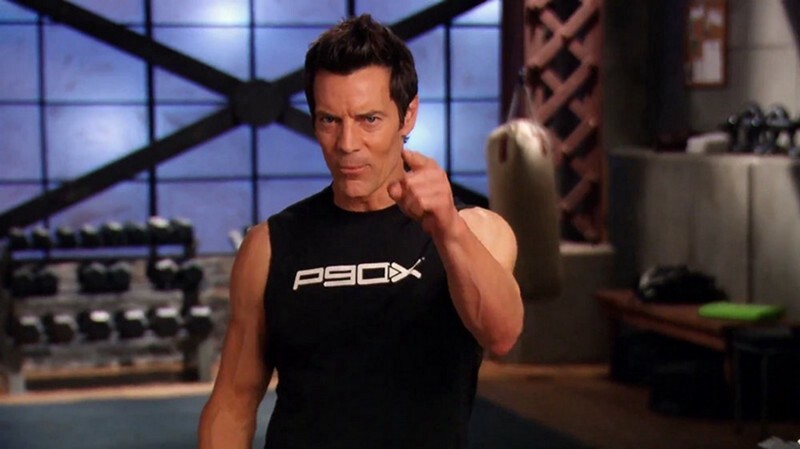 Re-engaging customers who seem to be inactive. Checking in with target customers quickly. Turning customers into brand or product advocates. Working as a team across CS, Support, Account mgt. Reaching customers even before they state a problem. Directly asking why people are not using a feature. Basing your help articles on questions they really want answered. Imagine a user chats to you, signs up, gets a series of on-boarding emails over several weeks that automatically encourage them to trial and purchase the product and educational articles that answer their questions. Intercom’s 3 main modules combine to do exactly that. 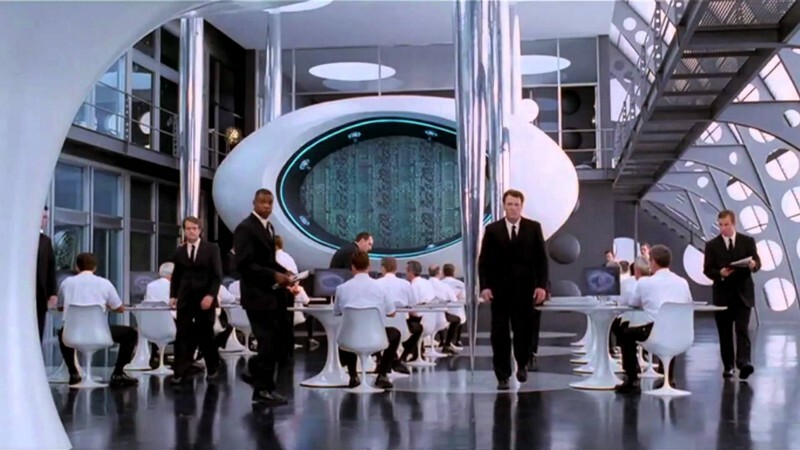 If Intercom was a movie, it would be like the scene in Men In Black where they approach the MIB building. All you see at the front is one security guard reading a newspaper but behind him is a door that leads to an entire world saving operation. 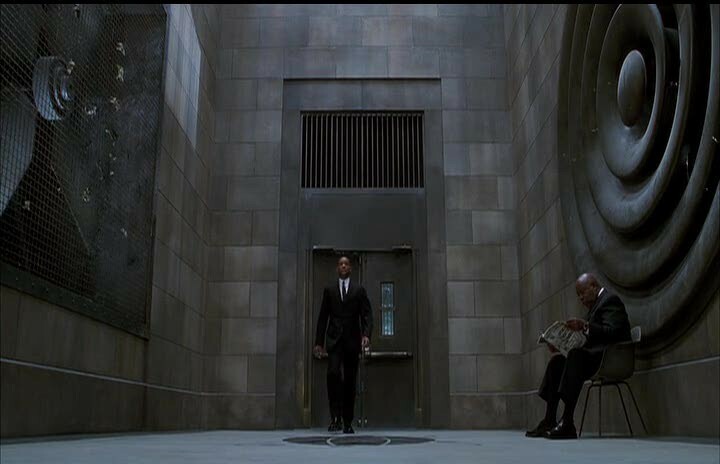 With Intercom, all the customer sees on the front-end is a simple chat box… bit like this guy in a hallway with a newspaper who says ‘hello’. 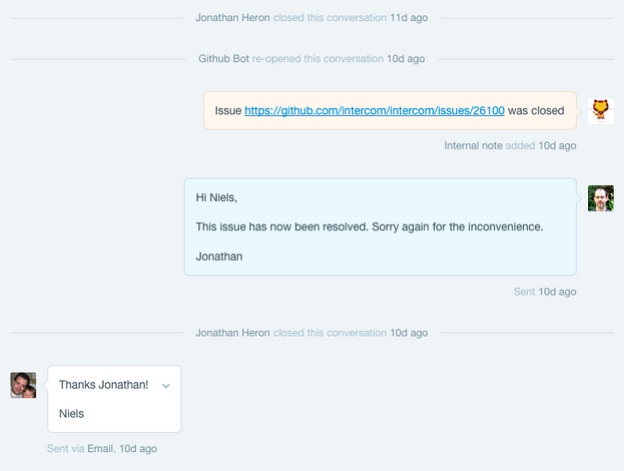 Intercom for most customers really is a chat box. For companies, it’s an entire communication, marketing and sales system where all team members can participate. It has 3 main modules. All emails and chats from one customer are in one feed on the Intercom Inbox module. All outgoing sequences of on-boarding emails for customers are done by the Messages module. All help and educational articles are handled by the Articles module. Customer success teams can work across all 3 modules alongside technical support and key account management. One bonus section at the bottom. We’ve added Mitchell Harper’s brutal and direct ‘No-one gives a sh*t about your product’ explanation for clearly thinking about customer outcomes at the bottom with some addition notes. It’s a great read and encourages focused thinking. “The failure to quantify and correlate the financial value of client retention by Customer Success is why most (if not all) CS initiatives fail / are not funded. Intercom and its add-ons have statistics to prove the value of your work. In addition, besides creating your own reports through filtering and exporting data you can use 3rd party add-ons to provide stats for churn, feature adoption, product engagement and more. These are the stats for one email message. These are the stats for an entire set of email campaigns in one table. 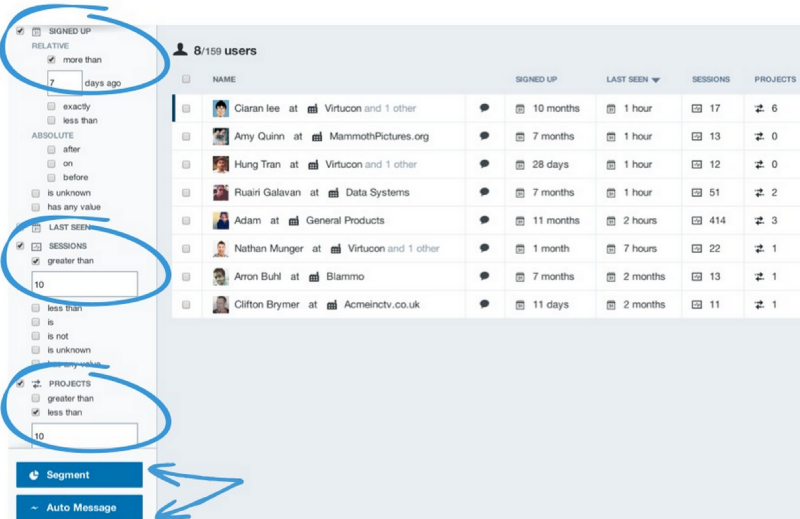 Intercom Add-ons like Notion provide a deeper range of stats for every team over and above Intercom’s own. It’s also possible and important to set up emails that send your customer success metrics to your clients e.g. how much they’re using your app and so much value it gives them. It helps clear out bad-fit customers. Ever wanted to see what a company’s full campaign of emails looks like along with click stats? 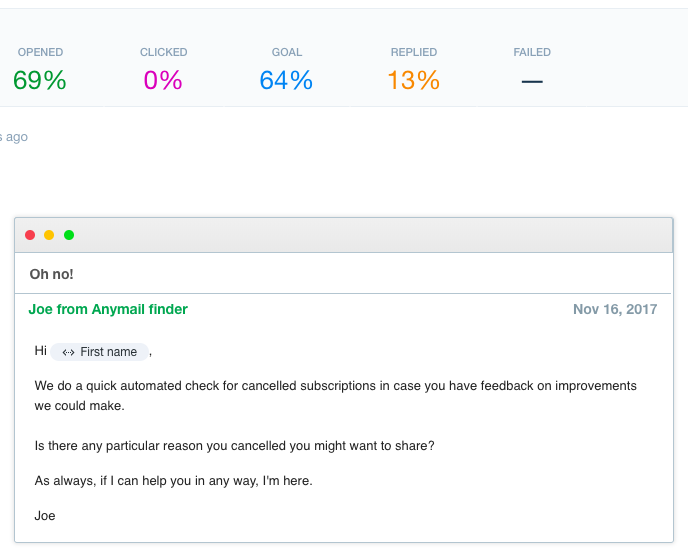 See the entire set of Intercom onboarding emails Upscope uses along with click through stats. How to do this with Intercom? Create an automated exit survey email. Within intercom you can set an email based on custom attributes which are triggered by a cancellation. In fact, you can send a sequence of emails if they have not replied to the first. On one project we’ve also created a form when they cancel and set up the cancellation email based on the option they select. For a deeper set of feedback forms, use the Intercom addon Survicate and checkout a tool specifically built for Intercom called Userfeed. 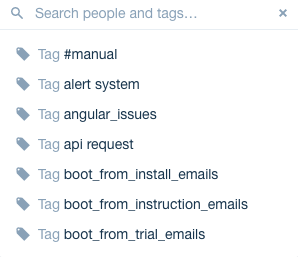 Tag feature requests as they come in and then add them up for proof. Statbot.io stats for Intercom tags. As we chat to a user we tag them with, for example, ‘Download file feature request’. Intercom gives you filtering options on tags, you can click through and see each individual conversation and the total number tagged for each one. To validate good fit customers, auto email them and then call them. 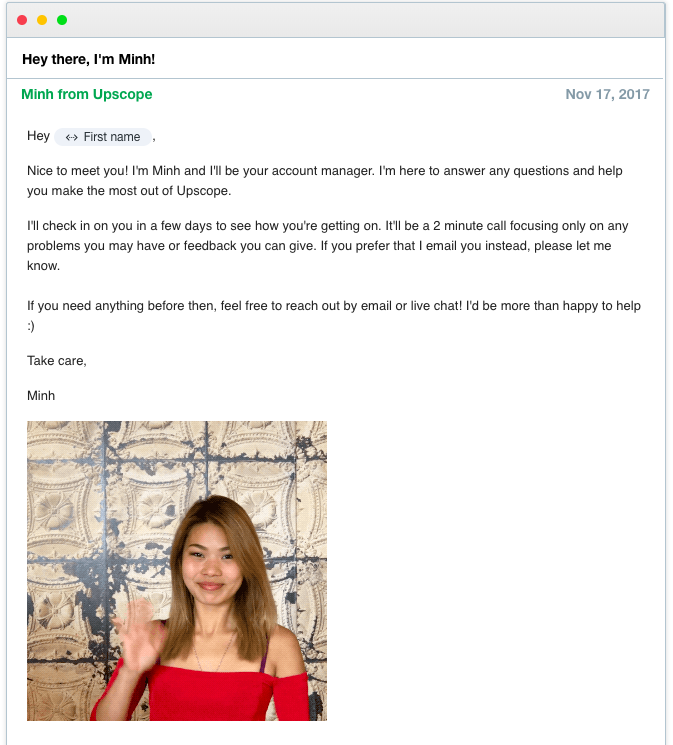 Above is an automatic email with a gif of Upscope’s Minh waving to say hello and telling them that she’ll call them but only to focus on the problem they’re fixing, not to sell to them. We set up an automatic Intercom email triggered a day after they’ve signed up and begun the trial saying that we might call. We state the specific questions and the time limit on the call and tell them it’s not about sales but understanding the problem. You’ll find out quickly if you’re talking to the 16 year old who signed up for his course work project or a real customer who you needed guidance. If you’re live chatting with them then also consider Dan Martell’s approach to live chat sales that also includes some very good simple and direct questions. Intercom onboarding emails won’t work for enterprise clients who never actually sign up but they might be in your Intercom lead list. Enterprise clients won’t necessarily turn up, sign up and begin the free trial in the way startups would. They may have entire buyer teams who ask a few questions about feature sets to compare you to others. They are looking out for certain features that, many startups especially, give the least attention to on their features page. 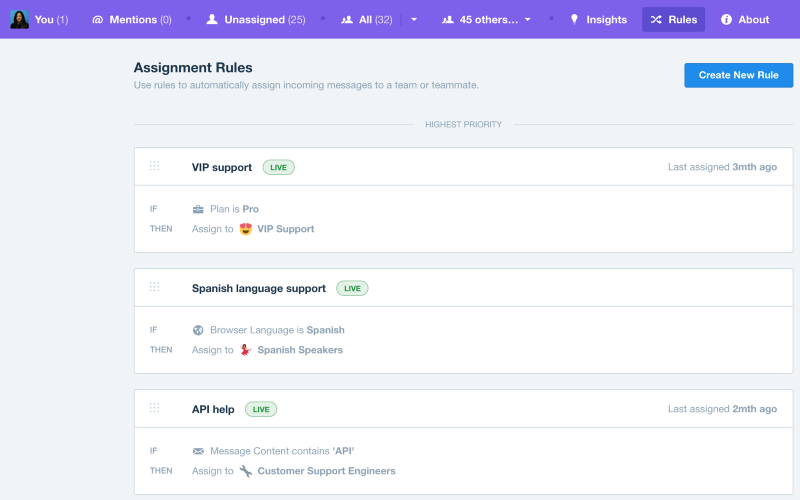 You can create in-app messages on your separate enterprise page and also send an email to Intercom leads (enterprise customers may not sign up but ask questions and give you their email) and include the following features if you have them. It also might help to check if you’re linking whitepapers and comparison tables in the in-app / email messages you send. How? Intercom records a users total sessions and your other activity based stats to figure out if they should receive an automated email. 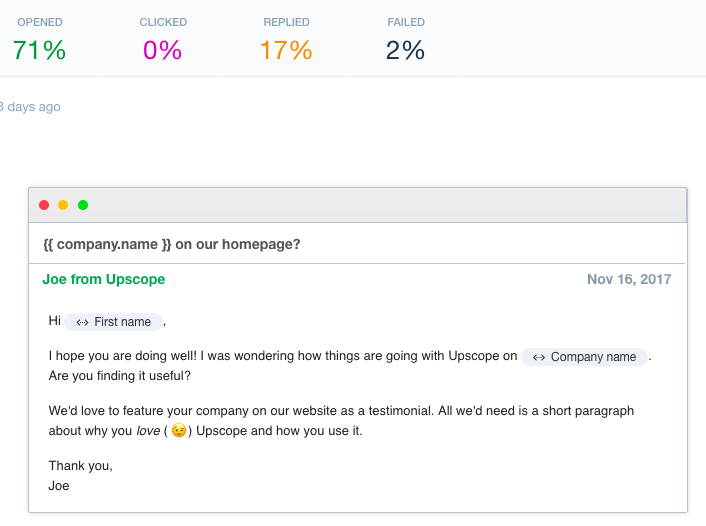 In Upscope.io, during a trial period, if the user has not actually begun to use the product they are sent the above email with an offer to extend the trial. It’s based on their use of a key feature which is tracked within Intercom. Ever wanted to see another company’s full set of emails with all the tricks? You can see the entire sequence of Upscope email templates for Intercom here. If you’re a real geek for this then check out a roundup of the best onboarding emails by 29 different companies. When you know your customers and you know that they’re not using a feature you might also know it’s because they were not on-boarded. On Intercom, rather than setting up an automated message which might catch the wrong people at the wrong time, you can create a manual message and send it to a usage based filtered group of customers. The message can contain a link to the Intercom help section which is generated by the Articles module or a blog post. It’s faster than sending them one by one and it’s a bit like a regular email they might get but exactly the one they needed. Use key Intercom custom attributes to generate a testimonials email. Lets say you can filter those for whom it’s clear they’re getting value from the service, for example if they’ve had over 1000 sessions and are using all key features. Set up an automated Intercom email to ask for a testimonial or give them another reason to share your product. If they’re motivated to prove to their boss how good they are then build them an email using their own key statistics from using your service. (It’s sad that I’m writing this and realise that we’re only doing the bare minimum here ourselves and yet everyone has to report upwards at some point). Let's say you reduce their customer support time. Got any stats for that? Remind them of the amount of time they’ve saved the company in an email with that stat included. Assign conversations automatically or manually based on who they are. You can assign conversations automatically so that the key account manager gets to see emails and chats from, for example, companies on the enterprise plan. Of course, some queries need to be read and then assigned. If the technical team gets a query and knows that customer success team need to be notified of a problem they can assign the conversation to them. Alternatively (and this is quite common and effective) you can send an internal note to a team member to ask for input on a conversation and then choose to assign the conversation if necessary. How often do they call Support? Factors will vary by product. Add up your health score and then contact them. There are ways to do some of this within Intercom directly via filters but on the first go it’s easier to see it in a spreadsheet. “We decided to send a quick follow up email to all the users who should be using the new SSO login feature but, for some reason, weren’t. This is nice and simple, as it should be. Using attributes, figure out if they’re not using a feature and contact them. Below is an example of an email Upscope uses to extend the trial of those who have not used it enough in the first 7 days of the trial. The intercom ‘Articles’ module allows you to build articles you can insert into chats and it now also auto displays articles in the chat even before they’ve asked a question. It’s tempting, when you first install intercom, to build articles off your own understanding of what people will want but many of these will remain relatively unread. If you build articles directly off questions as they come in, you’ll find it to be in tune with their desired clarity and they’ll feel you understand their real problems. Article titles that match questions speed up resolution time. Avoids the frustration of going through a long article to find the exact point. It feels damn good to give customers the exact answer in a short well written article. Better for SEO as they google the same questions they ask. Make sure the articles all link logically to each other so they continue to educate themselves in steps. “When was the last time you woke up and said “today I’m going to buy some software/consulting/services/apps/etc?”. Seriously, when was it? They want to buy a specific RESULT your product gives them. Intercom is built to tell one story all the way through because it allows you to set up both in-app messages, sequences of emails and an entire help section of individual articles linked to those in-app messages and emails. When you’re clear on the outcome your customers want to achieve it will change and impact every email sequence, in-app popup and help file. The Intercom co-founders themselves believe you should sign up to your own product every 2 weeks to test if the onboarding is still working. 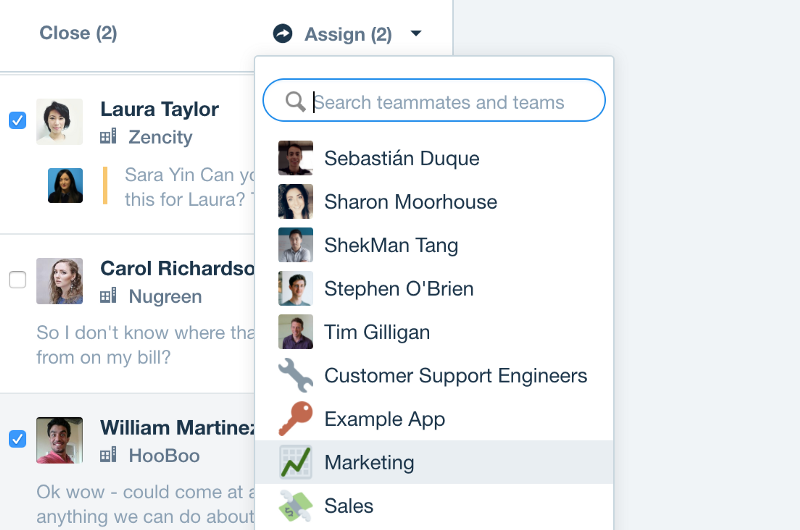 You can of course also segment customers using Intercom attributes because they are all slightly different. Our company sells [X] and is in the RESULTS business of [helping Y do Z] so what Intercom emails, in-app messages and articles do we need to help them achieve that result? Upscope.io is a 'no download' screen sharing tool used by customer support, success and sales teams to guide even the toughest most time consuming users through your web app from sign up to purchase by instantly seeing their screen and highlighting where to look next. Even when people need a product they don't buy into it so need to be walked through and that's what Upscope does. It makes that conversion to a buyer happen. There’s a 2 week free trial, learn more about Upscope starting here. What marks does team upscope get for the above 12 points? Re-engage customers who seem to be inactive. 6/10. We do this through automated emails rather than manual messages but there are some big gaps. Checkin with specific customers quickly. 5/10. We do this manually and again, the system has gaps which we’re trying to fix through building new Intercom notifications that will remind us based on features. Turn customers into brand or product advocates. 8/10. The automated testimonials email works very well. We need to improve with case studies. Work as a team across CS, Support, Account mgt. 8/10. We do work well and are starting to think the same way about customer success. Reach customers early when they have a problem. 7/10. We’ve layered several points of communication to reach out when they’re having install problems but partly because that’s such a key moment. More is needed outside of it. Directly ask why people are not using a feature. 5/10. We do remind them of features though the way the question is phrased is a prompt rather than getting to the depth of it. Base help articles on questions they actually ask 4/10. We would have got a nine out of ten on another intercom install but on Upscope we’ve really got to get our act together as we enjoy this exercise. 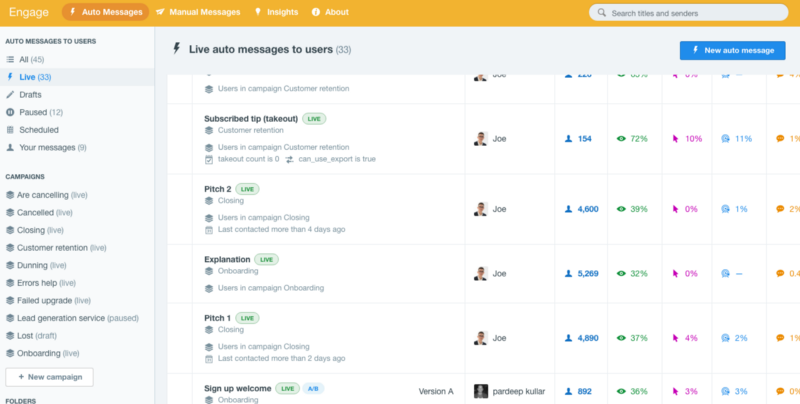 Want to see all the Upscope Intercom on-boarding emails? 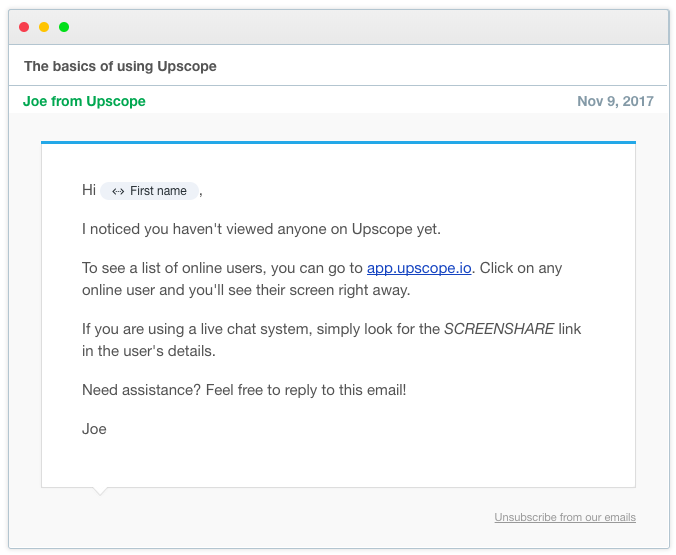 See the full set of email templates used by Upscope for helping users through key steps. Be kind, we’re learning too. Co-browsing and the phone. You’ll probably never know how simple this is.